The UTS Haberfield is one of our prime showcase Space Saver Rowing Systems racking installations in New South Wales, Australia. This rebuilt boat house reaches out over the water and comprises a boat shed downstairs and an elegant restaurant and club room upstairs. Have you noticed all these new impressive boathouses popping up across the US? How does a club go from a man standing by a river, through to a World Class facility capable of winning medals and achieving champion status? In recent times, they all have one common denominator: RowAmerica. Need more boat shed storage? 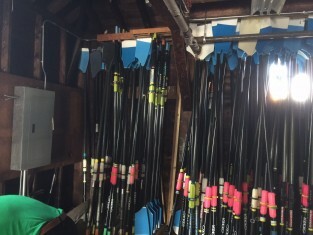 Is your boat shed so jammed full of equipment that you can’t actually move inside it? Do you struggle find the right equipment when you need it? Save your back and row faster. How can you fit more boats into your boat house? SSRS would like to send a big thank you to Houston Rowing Club, who recently purchased seven single Sliding Boat Racks. It was another very successful installation for SSRS and Houston Rowing Club can now use the extra space in their clubrooms for more equipment and more members.